can you beat my time? 1:53.05. Hey Hutch? How good is my time? Are we playing different games? My desert marathon time is 3:15 and that's screaming fast. Hutch's time on that level is 4:34. 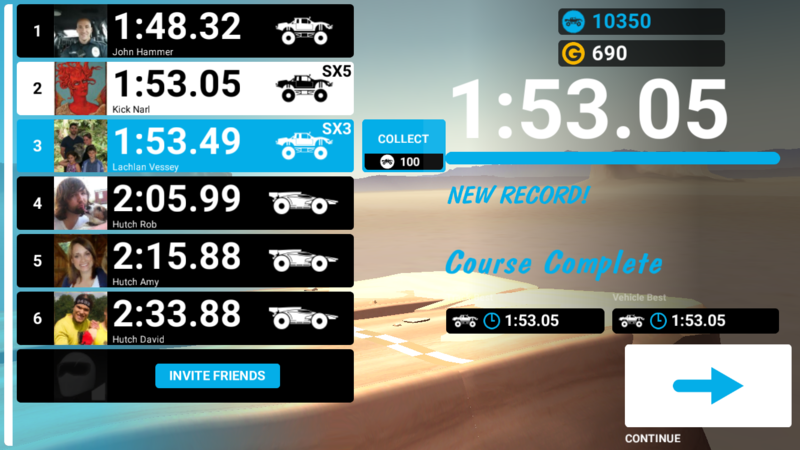 The times in your screenshot don't match any of the desert levels in my game. What's up? Never mind, this is rush marathon. 1:53 is pretty good, you're #7 on my list. #7....who and what is #1. Most of my tracks, Razi Razer is #1 or 2. I've got a few #1 times but not many. On some I'm as low as #12. If you check out the full friend code list that Gsearch posted, and add them all, you'll have a lot of VERY fast times added to your lists.